Adam was produced by Jeannette Glass from 1932 to 1934. It's getting very difficult to find and still in great demand. 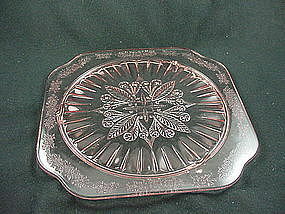 Offered here is the 9 3/4 inch footed cake plate in excellent condition. I have 2 available, price is per plate. See my other listings for more in this pattern. Adam was produced by Jeannette Glass from 1932 to 1934. It's getting very difficult to find and still in great demand. Offered here is the Square footed pitcher in excellent condition. See my other listings for more in this pattern. Adam was produced by Jeannette Glass from 1932 to 1934. It's getting very difficult to find and still in great demand. 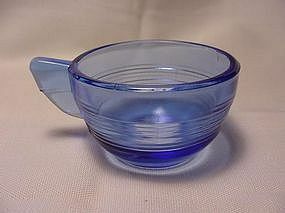 Offered here is the footed tumbler in excellent condition. See my other listings for more in this pattern. Adam was produced by Jeannette Glass from 1932 to 1934. It's getting very difficult to find and still in great demand. 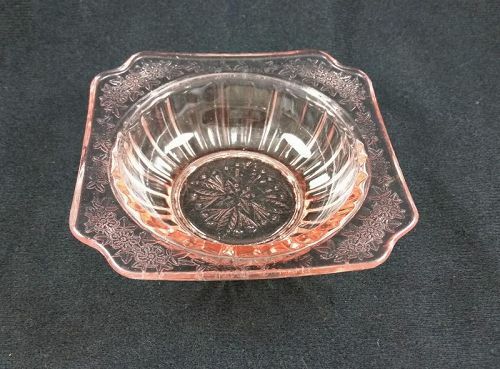 Offered here is the 9 inch divided dinner plate - called a grill plate as they were used at the diners of the time - in pink in very good condition. There is very light inner rim roughness from stacking, otherwise excellent condition. I have 4 available, price is per plate. See my other listings for more in this pattern. Adam was produced by Jeannette Glass from 1932 to 1934. It's getting very difficult to find and still in great demand. 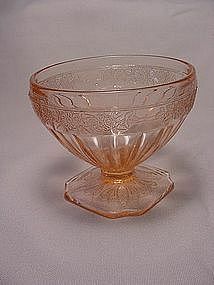 Offered here is the 4 3/4 inch berry bowl in pink in excellent condition. See my other listings for more in this pattern. Adam was produced by Jeannette Glass from 1932 to 1934. It's getting very difficult to find and still in great demand. 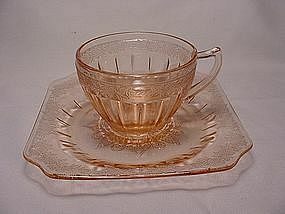 Offered here is the cup & saucer in excellent condition. I have 2 available, price is per set. See my other listings for more in this pattern. Adam was produced by Jeannette Glass from 1932 to 1934. It's getting very difficult to find and still in great demand. Offered here is the footed sherbet in excellent condition. See my other listings for more in this pattern. Adam was produced by Jeannette Glass from 1932 to 1934. It's getting very difficult to find and still in great demand. Offered here is the 7 3/4 inch bowl in excellent condition. See my other listings for more in this pattern. Akro Agate's Concentric Ring and Stacked Disc sets are identical except for the cup. Pictured here are assorted Concentric Ring items. 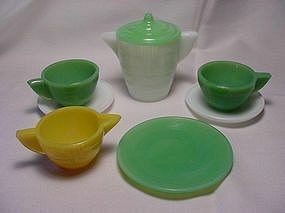 I have all of the following: 1 green cup & white saucer set for $18,and 2 green 3 1/4 inch plates for $12 each. 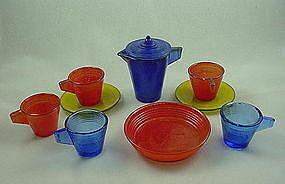 See my other listings for more Akro child sets. Akro Agate's Concentric Ring and Stacked Disc sets are identical except for the cup. Pictured here are Concentric Ring settings. 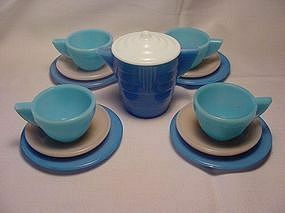 I have 4 blue cup & pink saucer sets at $21 each and 4 dark blue plates at $10 each. (Sorry, the teapot is sold.) See my other listings for more Akro child sets. Akro Agate's Concentric Ring pattern was made in the late 1930's. The transparent cobalt is the most difficult color to find. Pictured here is the large size cup in perfect condition. See my other listings for more Akro child sets. These Akro Agate items are from the Large Interior Panel set (16 panels). The color is transparent topaz and was only made for one year (1935-6). All pieces are in excellent condition and I have the following items available: teapot & lid $95.00, creamer $40(not pictured),6 plates at $18 each, 2 cup & saucer sets at $40 each, and 4 cereal bowls at $30 each. See my other listings for more Akro Children's Sets. These Akro Agate items are from the Large Interior Panel set. The color is transparent green - also called 'jade trans optic' - and each piece has 16 panels. 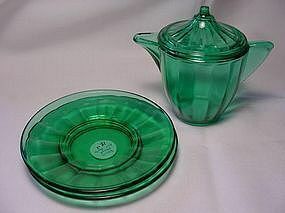 I have the teapot & lid for $95.00 and 2 plates for $18 each. All are in perfect condition. See my other listings for more Akro Children's Sets. Stippled Band was the first toy dish pattern produced by Akro Agate. The transparent topaz color pictured here was only made in 1935-6 and is very difficult to find. 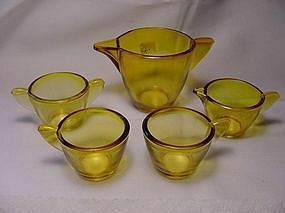 This is the Large size Stippled Band set and includes 4 cups & saucers, 4 plates, teapot & lid, creamer, and sugar & lid. The sugar lid is the rare dome - shaped style. One plate is chipped (price is adjusted accordingly), while the rest of the set is in excellent condition. See my other listings for more Akro Agate Child sets. 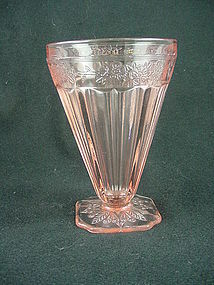 Stippled Band was the first toy dish pattern produced by Akro Agate. The transparent topaz color pictured here was only made in 1935-6 and is very difficult to find. These assorted pieces are from the Large size Stippled Band set and are in excellent condition. They are priced as follows: teapot $70, sugar $50, creamer $28, and 2 cups at $20 each. See my other listings for more Akro Agate Child sets. These Akro Agate items are from the Small Interior Panel set (18 panels). 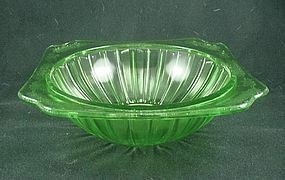 The colors are transparent topaz (made only in 1935-6) and transparent green ( called 'jade trans optic'). 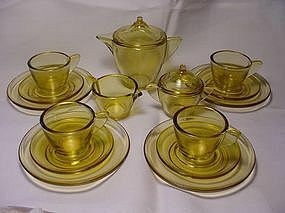 All pieces are in excellent condition and I have the following items available: 1 trans green cup & saucer set for $32, 1 trans green creamer for $75, and one trans green plate for $15. (Sorry, the topaz set is sold. )See my other listings for more Akro Children's Sets. Stippled Band was the first toy dish pattern produced by Akro Agate. 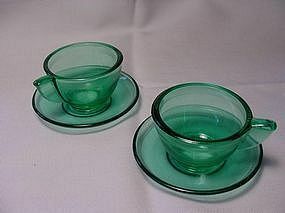 These cup & saucer sets are the Small size transparent green color. 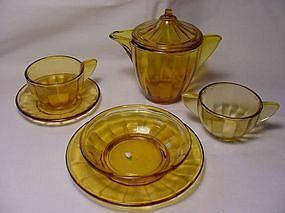 Perfect condition, price is $30 per cup & saucer set. 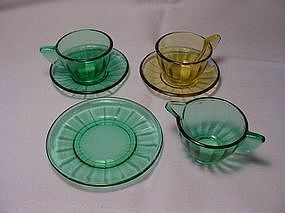 I also have 2 extra saucers for $10 each (not pictured) if you need them to complete your set. See my other listings for more Akro Agate Child sets.